The Research Training group GRK 2376 will determine how the nature of a confining environment like geometry, surface texture and surface chemistry affects the transition states and pathways of chemical reactions. This scientific approach will be addressed by researchers from Ruhr-Universität Bochum, Technische Universität Dortmund and collaborating partners from University of California, Berkeley. Their complementary scientific expertise enables to combine theoretical models and state-of-the-art experiments in synthesis, spectroscopy and surface science. Thus, the collaborative research will contribute to the fundamental understanding of confinement-controlled reactions. We are looking forward to welcome our first renowned Mercator lecturer, Prof. Dr. Kenneth N. Raymond from UC, Berkeley to our graduate school. He will contribute to a high-quality research training of our PhD students by giving lecture series and colloquium lectures in supramolecular coordination chemistry. Furthermore, the PhD students and PIs will benefit from his broad expertise by intense scientific exchange during his research stay at RUB and TUD in May 2019 and beyond. Two new PhD students joined our Research Training group. We welcome Julien Rowen and Kevin Scholten and wish them a successful work! We are glad to become part of the equality policy "Equal opportunities in DFG funded programs", which was developed by DFG funded collaborative research centres and the administrative department for organisational and professional development at the RUB. This policy will promote the career development of our young female researchers, as well as equal opportunities for men and women. Half a year after funding start of our graduate school, first results have been published in renowned peer-reviewed journals. J. Am. Chem. Soc. 2019, 141, 5, 2097. J. Phys. Chem. Lett. 2019, 10, 329. We welcome Patricia Palitza and André Platzek to our graduate school, who have just started working on their PhD research projects! Already ten PhD students have started to work on their research projects in order to address the fundamental problem of “Confinement-controlled Chemistry”. The Research Training Group provides a broad education and numerous qualifying measures for the PhD students. These are summarized in the qualification schedule. 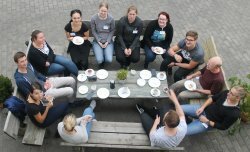 The first annual meeting at the Landhotel Klaukenhof, Lennestadt from September 9-15, 2018 was a full success! The funding period of our Research Training Group (GRK 2376) starts today and comprise 4,5 years of intense research on topics concerning “Confinement-controlled Chemistry”. As a result of successful application processes, the first cohort of PhD students will start soon. The German Research Foundation (DFG) has established the new Research Training Group Confinement-controlled Chemistry (see DFG press release), a program supporting PhD students with an interest in exploring the influence of geometrical confinement on reactions. The starter's gun for the Research Training Group GRK 2376 will be fired on July 1st, 2018, when the first cohort of PhD students will commence the research and education program.